Celebrate your special day with our bachelorette party bus when you are in West Palm Beach. There are bus rentals for parties from our agency that are in great demand among customers. If you have never thought of partying aboard our coaches, think again. With luxury seats, lighting, entertainment and refreshment facilities, these are nothing less than night clubs on the go. We can help convert any luxury limo coach into a party venue on the go. Let us know your party requirements and we can help you come up with a dream package ride. We also offer premier limos for hire. It is easy to book our bachelorette party bus rental West Palm Beach When you are in the area simply looking up our contact details in the regional directory. 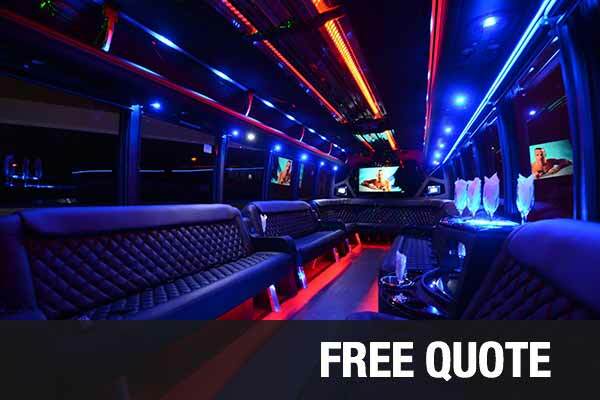 You will find our online gallery showcasing the different party coaches for hire. We can help you make a choice and place a booking as well. Avail of our small party bus rentals, which are passenger party buses of varying seating capacities. There are small and large coaches like shuttle buses, charter buses, and motor coaches. Book a coach as per the number of passengers you wish to accommodate. We help our customers choose a coach for party purposes as well. You will get different party amenities to hire as well. We have different kinds of limos and premier cars for hire under our limo service West Palm Beach. If you dream of a wedding ride in a BMW, Cadillac Escalade, or Chrysler 300 we can arrange the same for you. There are select and premier cars like Hummer Limos, Ford Excursion, Mercedes-Benz or Lexus available in our premier rentals section. These can be luxury rides for a day and a dream ride for your bride. We have the perfect solution for prom night rides or small group celebrations about town. Hire one of our limos or shuttle buses instead of party coaches. These are ideal for small groups of people not exceeding 14 in number. We have designed packages for different people to hire on the go. These come with a standard number of passengers, hours of booking, fixed distance travel and amenities on board. You can avail of discounts on our packages and select models as well. In general, our prices are found reasonable by our customers. City Place; it is a popular area for shopping, music, and concert. Norton Museum of Art; visit this museum to check out Chinese, French and American artwork. Palm Beach Zoo; it is a zoo as well as the garden area which has a rainforest experience. South Florida Science Center and Aquarium; you will find hands-on exhibits and aquarium to check out here. Hire one of our party buses for rent when you wish to check out these places in West Palm Beach.